Although I haven’t had my snail Jupiter for very long, I’ve just put together his big tank for him to grow into, so I’m doing a post about that in case anyone else finds it helpful. Because I went out to a physical shop, I was able to compare tubs and get the one I thought was best.  My main criteria was that it was clear enough to see my snail through, and that it was at least 70cm wide on one edge. The size you are seeking should chiefly be affected by how big your snail could grow, but you also have to bear in mind where you plan to put the tank. 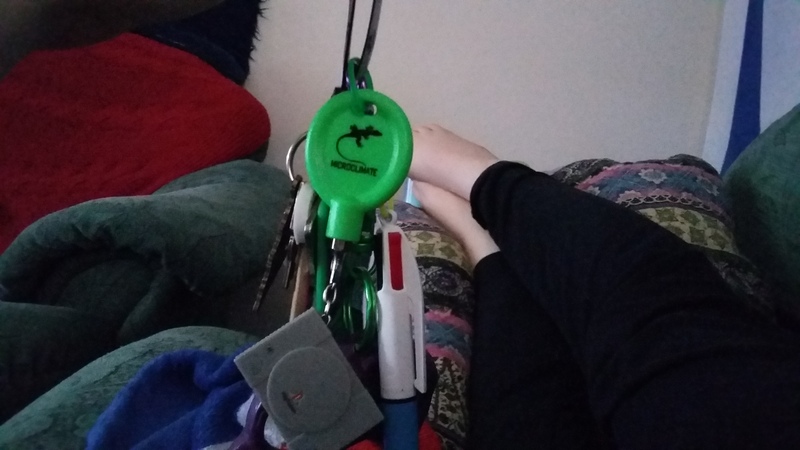 I knew I was going to put mine on a 50cm wide Ikea LACK table, but I knew this wouldn’t be a problem because it would only overhang slightly at both sides. Joop is an Achatina achatina; they can end up being 30cm long, so he’s got to have a lot of room! 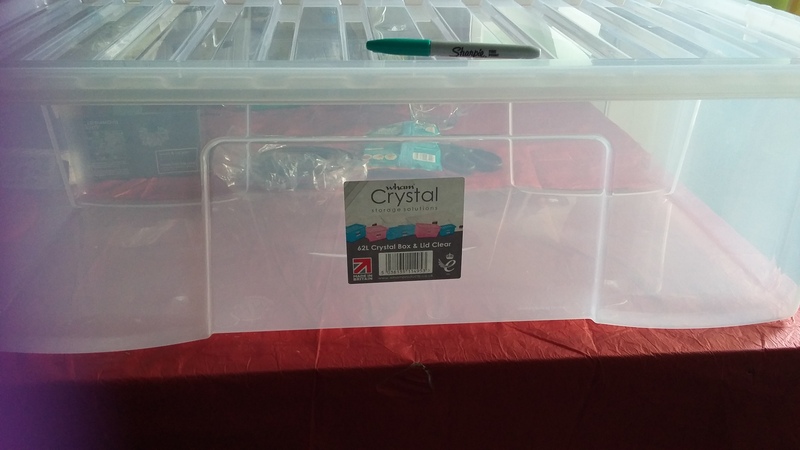 The box I chose was a 62L Wham Crystal tub. If I didn’t have the opportunity to physically go and look at tubs, it’s likely I would have ordered this box or a similar one. Note that while keeping pet snails in plastic storage tubs is a popular solution, you don’t actually have to do that. You could go ahead and get an actual glass aquarium or vivarium if you want, but that will be more expensive. You may choose to put some of these underneath the tank where they will touch the table, so that it is harder for it to slip off and onto the floor if somebody bumps into it. In terms of plastic boxes, I would recommend getting one with a clip-down lid. This is because snails like to hang out on the roof of their tanks sometimes (especially if they’ve just been put in a new one), and if they can find an opportunity to push the lid open, they probably will. I recall hearing an anecdote about a woman who came home one day to find her giant snail halfway up the wall! 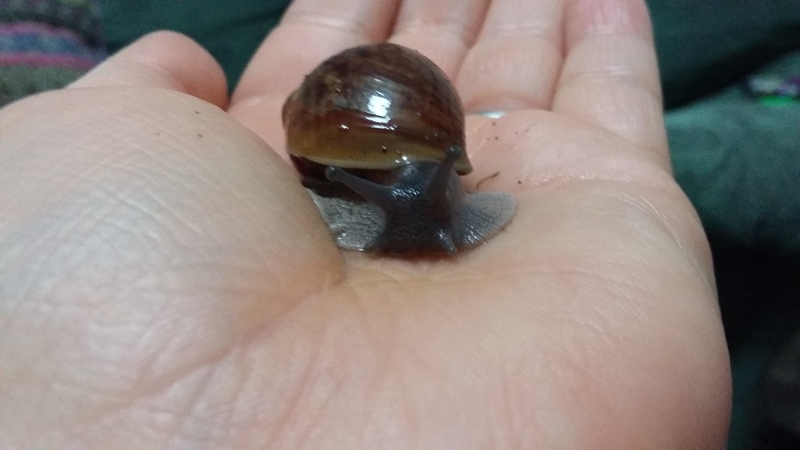 It is your responsibility to keep your snail firmly in their tub when you’re not handling them; while escapees should not be able to survive out in England’s climate, it is cruel to leave an exotic animal to perish outside. There could also be a lot of damage caused by snails and their eggs before they succumb to the environment or predators. Unfortunately there weren’t any clip-lid boxes on my shopping trip, but I found one that closes firmly enough that it always takes me a couple of tries to open it. Regardless of the kind of container you choose for your snail, it will probably require some modification. I used a hand drill to put ventilation holes in the lid of the tub (and I used the tub itself to collect the plastic shavings). I originally marked out where I wanted to put holes with a marker pen, but I ended up not doing them exactly. Just try to space them as neatly as you want while ensuring that enough air will get through. 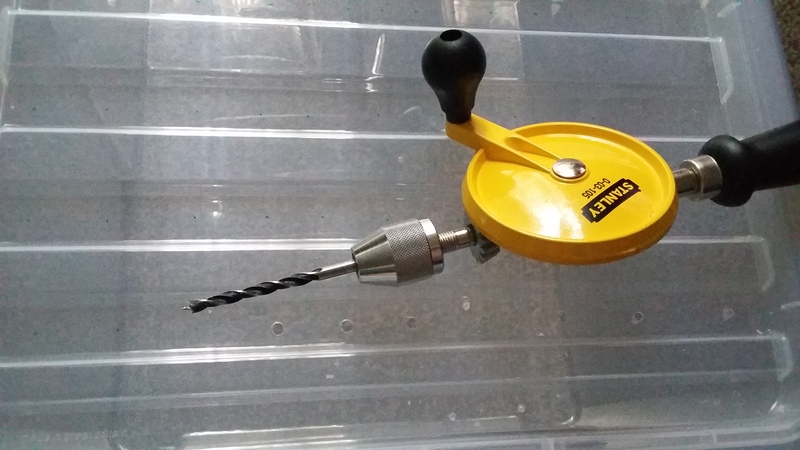 The only drill bits that wanted to go through this plastic lid were, for some reason, woodboring bits. It might seem counter-intuitive to cover up all that ventilation you just made, but you’ll need to do that with some chiffon fabric. This is because snails are vulnerable to pests, including flies, some of which are so small that normal fly and mosquito netting will not keep them out, but snail keepers have noted the success of chiffon. Flies can be especially attracted to a snail’s food, which can smell quite quickly due to being in a hot and humid tank. You’ll need to trim chiffon to the appropriate size and then attach it to the outside of the lid. I used a combination of superglue and sellotape on the very edges of the chiffon and box lid. 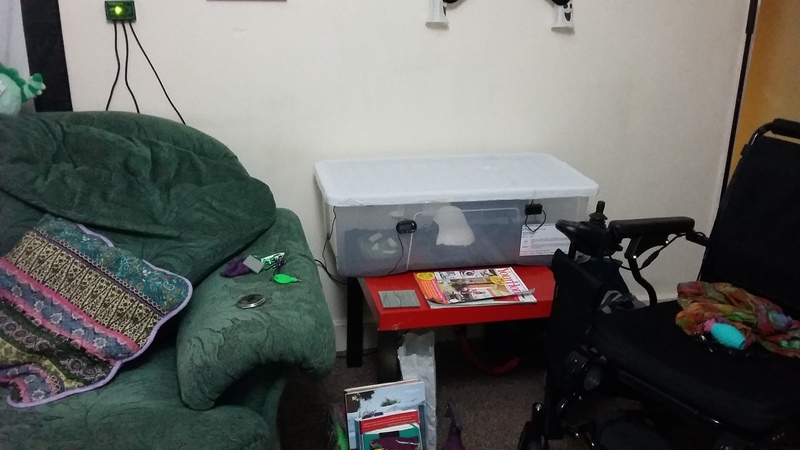 Make sure that any glue or other substances you use are far enough away from anywhere the snail could touch. It might be that you have a tub with this sort of vent already installed; I would still recommend putting chiffon over the vent on the outside, as it is unlikely to keep out small bugs on its own. You may also need to drill holes anyway as the ventilation may not be sufficient. 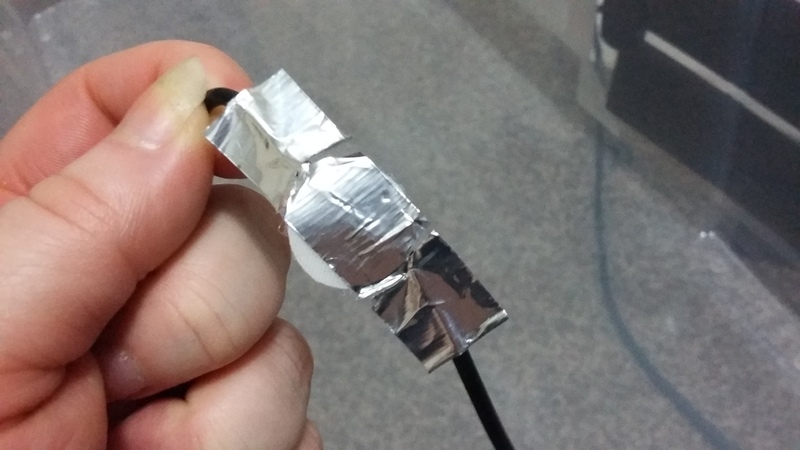 Once you’ve sorted out how your snail is going to breathe and be shielded from pests, the next thing to think about is heat and its associated accessories. Giant African and Giant South American Land Snails are exotic pets. The temperature and humidity of your house is not going to match their native environment, but in order for them to be healthy, happy, and loved pets, you need to make that happen. 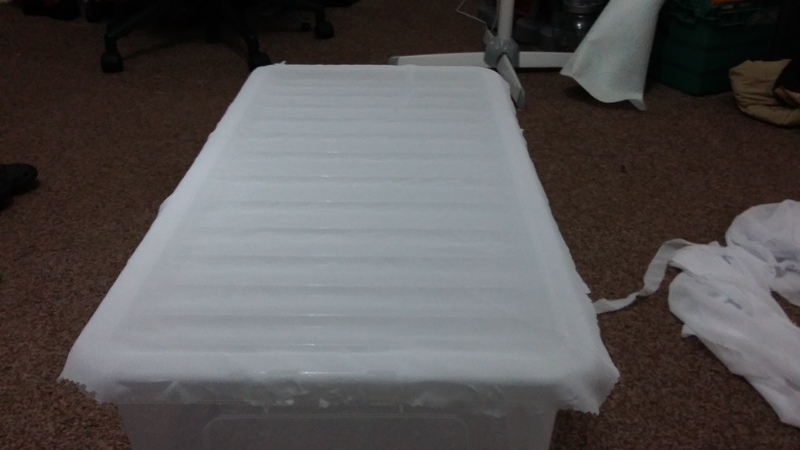 The first thing you’ll need is a generic heat mat for mounting outside of the tank. Some exotic animals and reptiles want heat mats inside their tanks, but this is not something you want to do for a snail as they risk being badly burned. 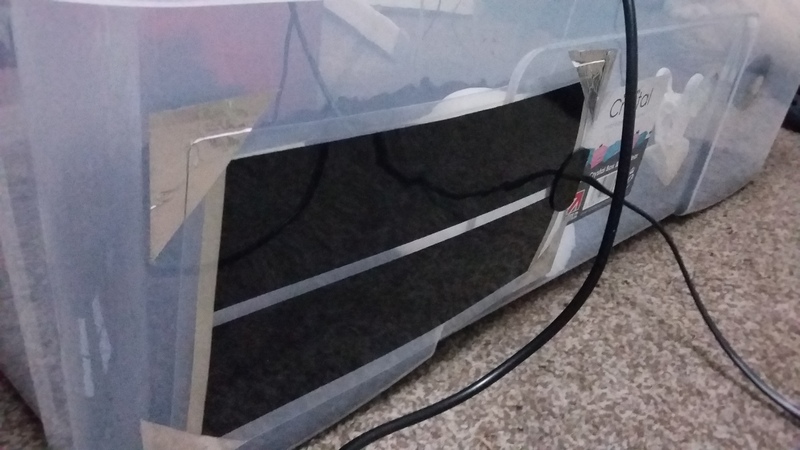 The heat mat I have came with my snail, so I have no personal recommendations in that regard, but it should take up around 1/3 and no more than 1/2 of the tank surface. 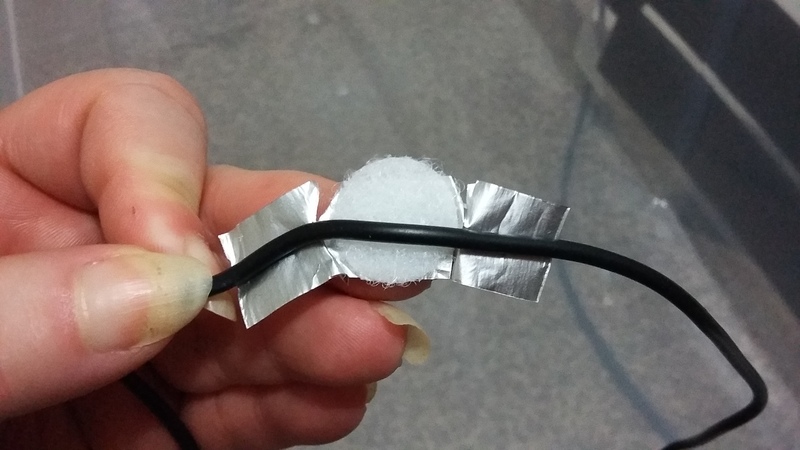 It can be confusing to mount a heat mat facing the right way; from what I understand, the side with the raised plastic bit around where the wire comes out, is the side that should be facing into the tank, although heat may come from both sides of the mat to a certain extent. A friend of mine sent me some aluminium tape to mount the corners of the mat with. You should also put up some foil behind the mat to help redirect stray heat back into the tank. 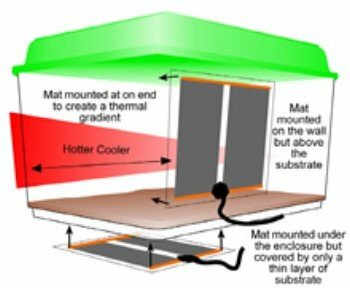 The mat should be positioned to create a heat gradient so that the snail can move to a cooler or warmer part of the tank as it pleases. I don’t know who the original author of this picture is unfortunately. 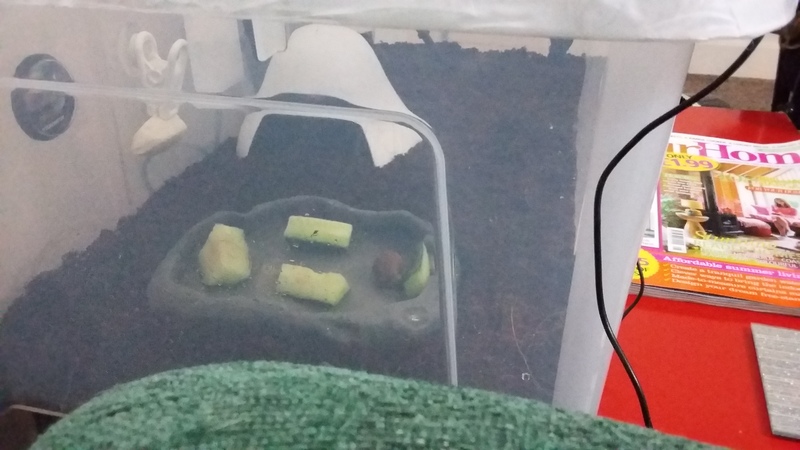 It is less preferred to put the mat underneath the tank with snails, as not only can this dry out their substrate, but snails often burrow, sometimes because they want to cool down, and they risk being burned by the mat if they dig above it. 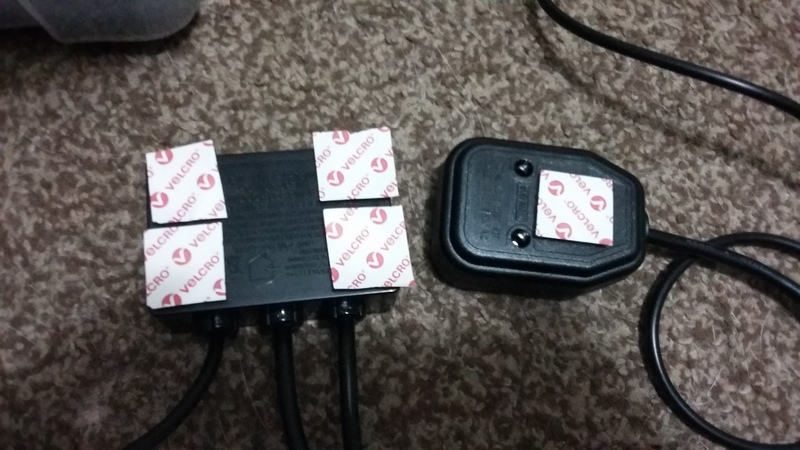 However, your heat mat doesn’t just plug straight into a socket. It plugs into a thermostat, which in turn plugs into the mains. 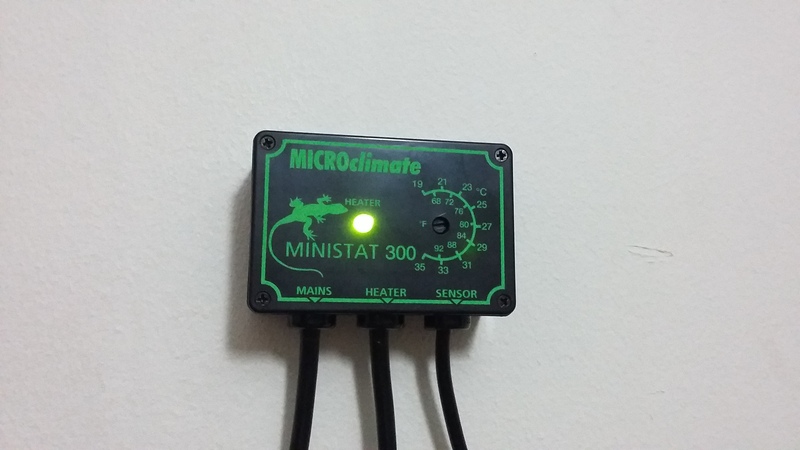 The probe for the thermostat goes in the tank, hanging in the air in line with the heat mat, next to a thermometer probe, and the stat makes the mat cut off when things are too hot, and kick in when things are too cold. 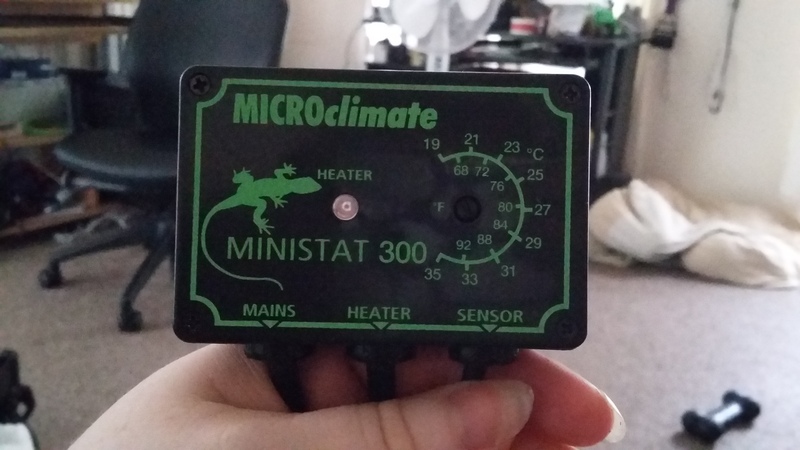 My friend Charlotte sent me a Microclimate ministat. It took some getting used to, but I seem to have got it to the point where it is keeping the tank at a good range for my snail. 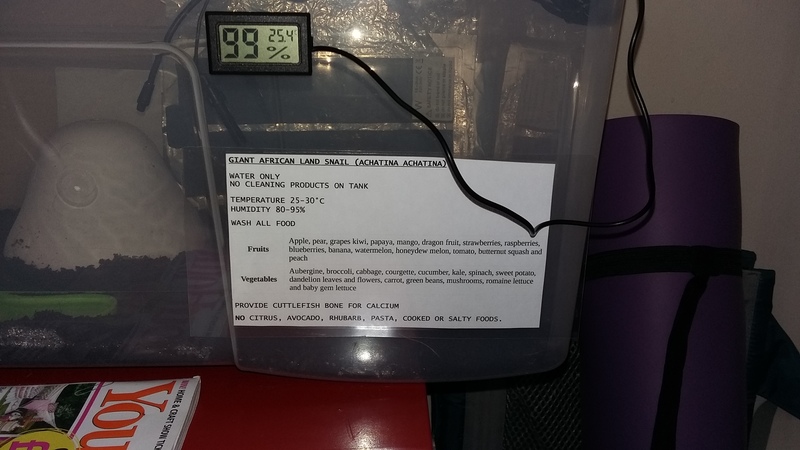 Bear in mind that the number your stat is set to will not always match the temperature actually being produced in your tank, hence the thermometer. You might have to set the temperature higher or lower than you want in order to achieve the right temperature in practice. The thermostat also comes with a cool tool to turn the dial; it prevents you accidentally setting the wrong temperature if you lean on the panel and stops visiting children from tampering with it. I had success using adhesive velcro dots to mount the stat panel and its socket on my wall. Ta-da! Most people would probably prefer to mount the stat on the outside of the tank itself, but mine wouldn’t have reached the mains if I did that. The sockets in this room are quite unevenly placed. Keeping a snail shouldn’t result in too much extra heat in the room like other exotics and reptiles can. Dysautonomia means that heat makes me very ill, so sadly I will probably never be able to keep bearded dragons or snakes because of the heat generated. As I sometimes like to detach everything while cleaning a tank, I used velcro dots to hang a thermometer probe from a ceiling to make it removable. 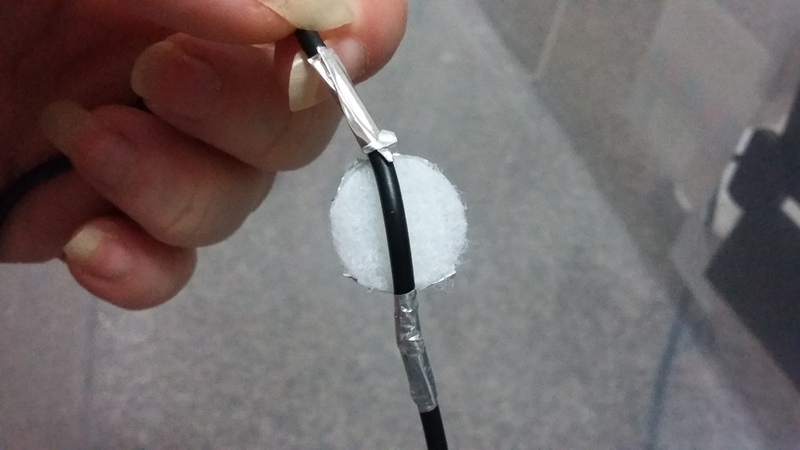 I used the aluminium tape to hold the dot to the wire. This is then attached to the corresponding velcro dot on the roof of the tub. You should have a thermometer at the cool end of the tank too, and some people also put one in the centre. My thermometer at the hot end has a built-in hygrometer, so I have a dial hygrometer on the wall of the cool end. 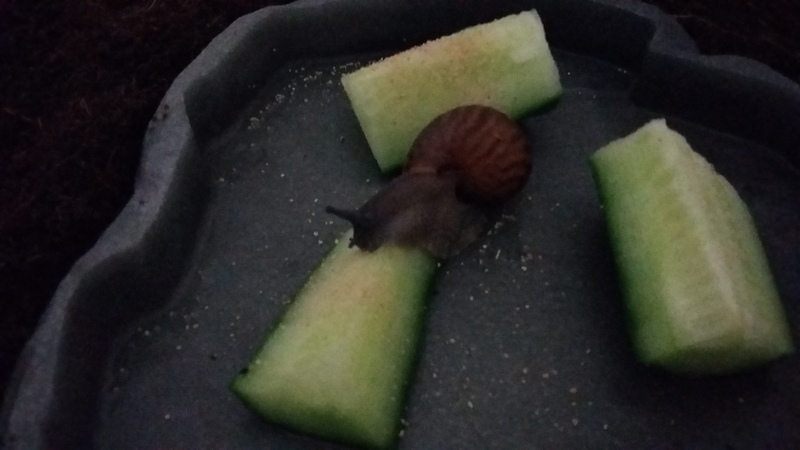 After cleaning the tank inside with a wet cloth (just water), adding the correct coconut coir substrate, and putting in some food, you can move your snail in! A good window for me to watch him through. A little pond of shallow water so he can drink and bathe. Don’t forget to get a sprayer bottle so you can mist the tank a couple of times a day. I’ve put a label on mine saying “Water only ⚠️” to make sure that people don’t use it for anything else which may later harm my snail. So it might be because he’s still a baby or it might just be a natural consequence of his eyesight, but he doesn’t seem to find his way to food or his current cuttlefish bone unless I handle him and plop him down on them. So, be wary of that and try to make sure that tank objects are not so far apart that your snail will literally never see them. But also, they might just not feel like eating for a couple of days anyway. Snails sure know how to worry you, especially if you are more used to caring for a dog who eats all their food at the same time everyday and doesn’t sleep non-stop for 3 days. Snails have a learning curve and I am definitely still on it. The tank on my table. 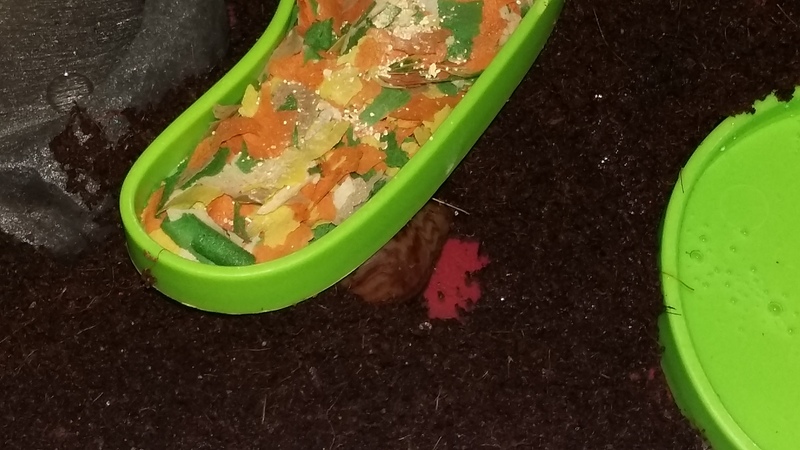 Burrowing under his fish flakes. I advise making a label with basic information about your species and sticking it to the outside of the vivarium. Don’t worry, the digital hygrometer seems to think the air is always 99% moist even when it isn’t. 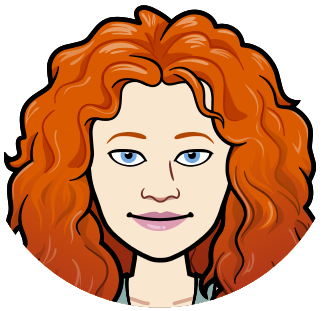 Mine includes a basic list of fruits and vegetables a snail can eat, copied from online, and also a note about what they must not have. 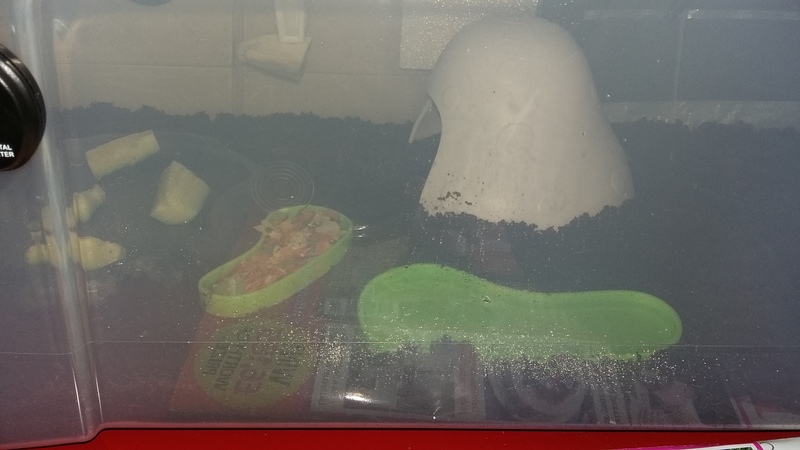 Not only would emergency personnel probably be pleased that they didn’t need to call an animal warden to deal with whatever was in the tank, but if I unexpectedly ended up in hospital for a week or something, then at least I know that my husband is not going to accidentally feed Joop some avocado. You never know who might unexpectedly have to deal with your tank, and what it could mean for your animal if someone gets it wrong. 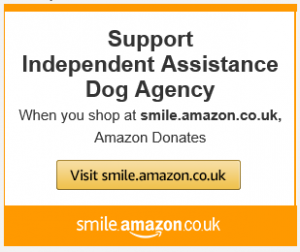 For some in-depth information about keeping and caring for pet snails, see petsnails.co.uk ! There is also information about the problems that can happen to snails.